"Christian Nissen was the first Director General recruited from outside the firm to serve as the CEO of the Danish Broadcasting Corporation. He was also the first Director General to be sacked by the Board of DR, due to political disagreements about the role of public media journalism in relation to government. But Christian is not bashful about having been sacked. His attitude parallels an aphorism in Silicone Valley where they say: "if you haven't gone bankrupt at least once you haven't really been trying". 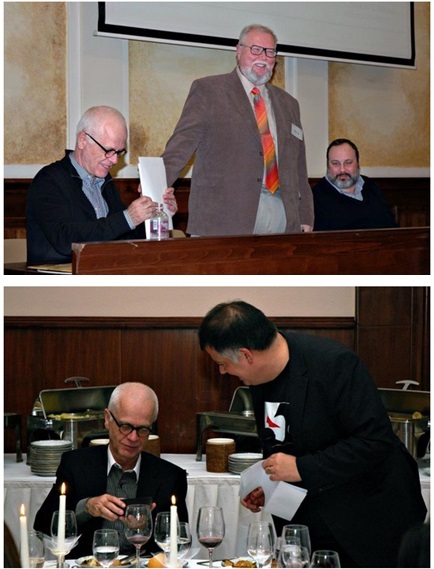 Top: Christian S.Nissen and professors Greg Ferrell Lowe (Incomming chairman of emma) and Robert G. Picard at the emma 2012 lecture. Christian earned a Master of Arts in social science in 1972 from the University of Copenhagen, and then a second degree in political science from the University of Aarhus. He began his career as Associate Professor in International Politics at the University of Copenhagen and has worked in various management positions for Danish public administration, including a period at the Ministry of Finance and another as Chief Financial Officer at the National Museum of History in Denmark. He has also been an active contributor to the intellectual development of public service media, beginning in the period between 1994 and 2004 as Director General of DR and during which time he also served as Chair of the Digital Strategy Group for the European Broadcasting Union. Today Christian has returned to academia and is Adjunct Professor in Management at the Copenhagen Business School. He also contributed his talents and experience as Research Associate for the Media Management and Transformation Centre in the Jönköping International Business School in Sweden. He is a member of the Editorial Commission for the Open Society sponsored by the Soros Foundation, serves as Chairman of the Board for Roskilde University, and is a member of the Board of Directors for CARE International in Geneva. Christian has authored articles in Danish and English, and contributed editorial service in the production of two recent books in English, the 2006 publication titled: Making a Difference: Public Service Broadcasting in the European Media Landscape; and most recently the 2011 title from NORDICOM: Small Among Giants: Television Broadcasting in Smaller Countries". The European Media Management Education Association (emma) is an international not-for-profit organisation that was founded in 2003 in response to the dramatic growth in media management courses and programmes at higher education institutions throughout Europe.